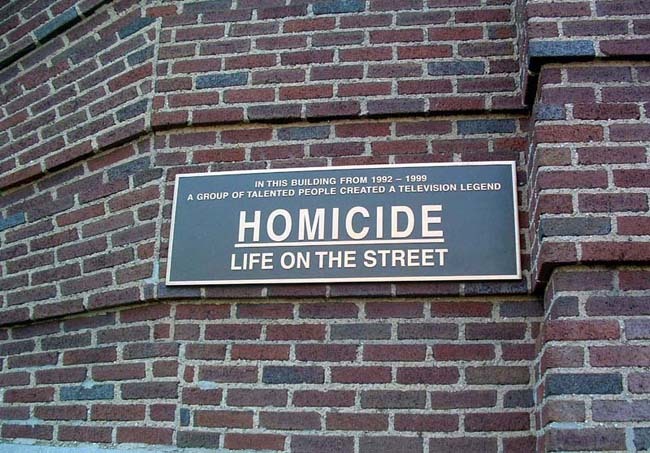 This web site is a set of bookmarks pointing to online news articles, web sites, events, previews, reviews, chat transcripts, and merchandise related to the TV series Homicide: Life on the Street. In other words, a list of links. We only do links. Please click on the blue-highlighted links all over this site and explore the world of Homicide: Life on the Street. Publicizing the links that you find on this site is encouraged, as long as credit for finding the link is given and a link back to this site is provided. Additions, deletions, corrections, questions, comments, and suggestions should be directed to Borderline Productions. This site was originally designed and lovingly maintained by Dave Locke. Some photos from Laurel Krahn. Icons by John Bobby. Fontana graphic by Amanda K. Paulette. Despite NBC's cancellation of the show, Homicide airs regularly on Sleuth in the US and ITV4 in the UK, sporadically on TNT, and on other progressive TV stations and networks around the world. Please take a moment to read this web site update. House Unites Laurie and Braugher In this September 21, 2009, article from NPR, Linda Holmes previews the season premiere of House. 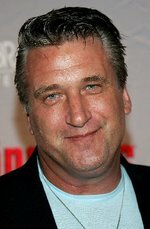 Daniel Baldwin And Wife Joanne Welcome New Baby, Daughter Finley Rae In this August 7, 2009, article from the Newark Star-Ledger, Vicki Hyman reports good news from Daniel Baldwin. More from People Magazine. 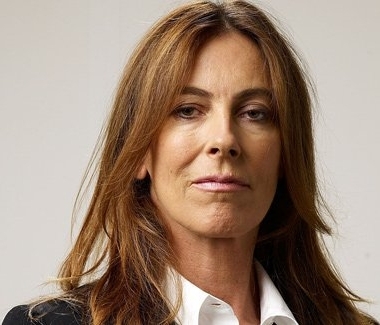 Kathryn Bigelow In this June 24, 2009, article from the A.V. Club, Scott Tobias catches up with the director of the classic Homicide episode, The Documentary. More from the New York Times and NPR. The Philanthropist In this June 22, 2009, article from Variety, Brian Lowry previews Tom Fontana's new drama with a familiar cast member. More from the Denver Post, Zap2it, the Pittsburgh Post-Gazette, the New York Times, Film.com, Monsters & Critics, and the A.V. Club. Callie Thorne Gets To Play With Fire In this April 14, 2009, article from the Los Angeles Times, Greg Braxton profiles the supporting actress from Homicide and The Wire. Southland In this April 8, 2009, article from the New York Times, Alessandra Stanley compares Southland and The Unusuals to The Wire, right down to the plagiarism, with a mention of Homicide as the broadcast network pioneer. More from the Baltimore Sun, the Kansas City Star, and the Toledo Blade. The News is the 2008/2009 Homicide news archive including cast movie and TV projects, cast profiles, Emmy nominations and snubs, auction and casting news. Homicide France Marc's new site for the show featuring, cast/producer descriptions, videos, and a forum. Andre Braugher Renee's site for Andre Braugher featuring news, photos, bio, forum and Thief. 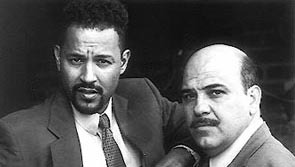 The Sites are all known official and fan web sites devoted to Homicide. Included are sites devoted to the show, actor sites, Baltimore and Homicon links, and links to fan fiction. The Stuff is where to buy Homicide and Wire videos, DVD's, books, t-shirts, caps, coffee mugs, scripts, and music. The Dead Beat In this 2/5/93 article from Entertainment Weekly, Bruce Fretts previews a new TV series called Homicide. The Vault is organized by year and contains links to the articles back to 1993 that are still available on the Internet. Also included are chat transcripts, cast and crew profiles, and reviews of various episodes. The H:LotS Files is the place where Dave Locke takes you on a Google journey to informative posts made to alt.tv.homicide. Contributors: Cate Agnew, Almira Alvarez, Steven Aoun, Sally Bainbridge, Karen Baratz, James Barber, Loretta Bettis, Moyra J. Bligh, John Bobby, Jeff Bockelman, Theodore Bogosian, Tiana Bradley, Robert Brand, Byron Breedlove, Robin L. Bristow, Madelaine Burgess, Patrick Burke, Chris Butler, Elton Byington, Judy Chandler, Anthony Choi, Madonna Ciccone, Marian Cole, Lucy Conger, Katie Conley, Nancy Cosgrove, Shannon Courtney, Bob Cradock, David Cross, Ashley Cathleen Crowe, Maura Crowther, Claire Danes, Nicole D'Isa, Teddy Durgin, Elizabeth Eccher, Lisa Edwardsen, Suzy Elmore, Steve Erickson, F. Evans, Gary Farber, Tom Fitzharris, Dave Gaffen, Erin Gantt, Grant Gedemer, Diane Gilcreast, Judy Gissel, Judie Gladman, Gary Grady, Brenda Grant, John Gregan, Tim Grossner, Bryan Harris, Mark Harris, Barbara Henderson, Mary Hendron, Kathy Hermanowski, Kate Hodge, Carol Hoshall, Phoebe Howard, Marlyn Huckeby, Ethan Hyman, Robin Irby, Lorrie Israel, Ashley Jones, David Kalat, Kevin Kearney, Andy King, Chuck King, Jim King, Gerald Keith Kirby, Dennis Kleen, Sherrie Kraemer, Laurel Krahn, Sandi Lemon, Jason Lempka, Brian Liscek, Dave Locke, Rosie Logsdon, Mary Ann Lutz, Joffrey Malek, Catherine McHenry, Adam Miller, Janice Mintel, Lorna Mitchell, Jim Molis, Karen Monroe, Ashley Morris, Kathleen Murphy, Cynthia O'Connor, Kirk Odegard, S. E. Olson, Kristyn Osborn, Kelly Parker, Kirsten Parker, Rebecca Pasillas, Victoria Paterson, Amanda K. Paulette, Pamela Perry, Kirstin Pesola, John Pilgrim, Maria Pitt, Staci Pittman, Jenny Pond-Muckerman, John C. Powers, TaraDiane Pratt, Jerome Preisler, Todd Prepsky, Tim Price, Valerie Quennessen, Christine Reilly, Steve Rhodes, Jodee Rubins, Djuna Rykiel, Debby Saadi, Barbara Sandoval, Aaron Schatz, Michaela Schlocker, Laura Schwag, Robin Schwalb, Laura Schweigman, Jeremy M. Scoble, Kay Scoble, Alan Sepinwall, Tina Shackleford, Mary Agnes Shearon, Patty Shield, David Simon, snarkygirl, Jeff Spence, Aphreal Star, Alana Stark, Bernard J. Starzewski, Dennis Sullivan, Edward Tanasychuk, Jason Tippitt, Suzanne Titkemeyer, Carol Varnadore, Teri Vogel, Chuck Watt, Eva Whitley, Kathy Wilhelm, Kelly Willis, Mari Wilson, Tori Wright, Esther Wynn, Ben Zarit, and Willie Zaza.